The Liquorice Jujyfruit?! What gives?! Ok some people might not think this is worthwhile subject of a blog but you know what I don’t care! First off let me proclaim that I love candy! I will find any excuse to eat candy-alot of the time I justify eating it when I watch a movie-because everyone eats candy while watching a movie right? RIGHT! So I have had one gripe with one of my favorite candies, JUJYFRUITS! 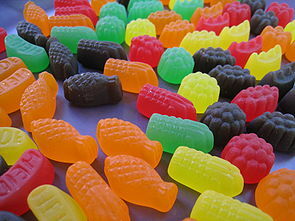 Oh man, I could eat Jujyfruits all day long! But there is just one thing that has bothered me for years that I never really expressed to anyone before-why is the damn purple Jujyfruit licorice flavored?? It states it’s a fruit flavored candy-shouldn’t it be grape?? I know this candy has been around for like 200 years but really-this isn’t Jujyroot candy! Licorice is not a fruit! Now don’t get me wrong I actually LIKE the licorice Jujyfruit alot it’s just a bit odd when you’re eating the lime or orange flavor and then you suddenly got the black licorice flavor screwin’ up the program in your mouth! That’s total tastebud deception!! They changed a flavor in 1999 when apparently Mint was included in the mix. Apparently they got alot of complaints about the mint flavor-well DOYE! Yeah, good move taking mint out of the mix- that digusting flavor ruined the whole damn party time and time again! Who thought that was a good “fruit” flavor to add to the mix? Do the people at the Heide candy company even understand what a fruit is??! 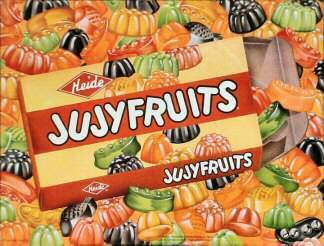 Anyway the shapes of the Jujyfruits candies are listed on their wikipedia page as- Pineapple, Tomato, Raspberry, Grape Bundle, Asparagus Bundle, Banana, and Pea Pod. What the HELL is that all about?? Who the hell was in charge of this fucked up situation?? Tomato???! Asparagus bundle and………..PEA POD?? WTF? Well it’s clear there’s no rhyme or reason to the operation down at the Heide candy company! I officially give up!! I loooove candy!! All sorts of candy especially the sour kinds. Well last night i was eating some Runts (the big box of ’em) and really began to notice how those damn banana Runts we’re totally ruining a beautiful experience!! You ever have one guy at a party who totally makes people feel uncomfortable and ruins it for the rest? Well that guy in a candy alternate reality is the damn banana Runt!! But it gets worse cuz there are like five thousand of them in a single box of Runts! Who ever really thought banana candy was a good idea anyway? Runts could be the BEST candy out there but for some reason they don’t have the guts to tell the stinkin’ banana Runt to split! Anyway I’d buy Runts more often if they would just kick him out of the gang already…. I don’t know about you, but I often find myself thinking about how hot dogs are made. At the grocery store, biking through traffic, at the bar and even when making love. The mystery behind this processed meat has piqued my interest for some time now and today, I just couldn’t take it anymore – the curiosity was KILLING me!! A japanese boy once accidently ate 53 3/4.